Once again, Rockingham will be hosting the first and last round of the 2018 BARC Speed Championship. It’s a proper grown up track, featuring a long opening section, tight hairpin and then open left and rights. So, your car should probably be set up a bit stiffer, as speeds will be higher. Off the line and its a good start to Brook and the left, right, left hand kink. Neatness is more important than being a hero here (you should avoid the big sausage kerbs) as the second left hander leads onto the fastest section of the track and you should aim to carry as much speed as possible. Up on the banking and move up to the wall. It’s slightly less scary up there and opens up your line of sight. 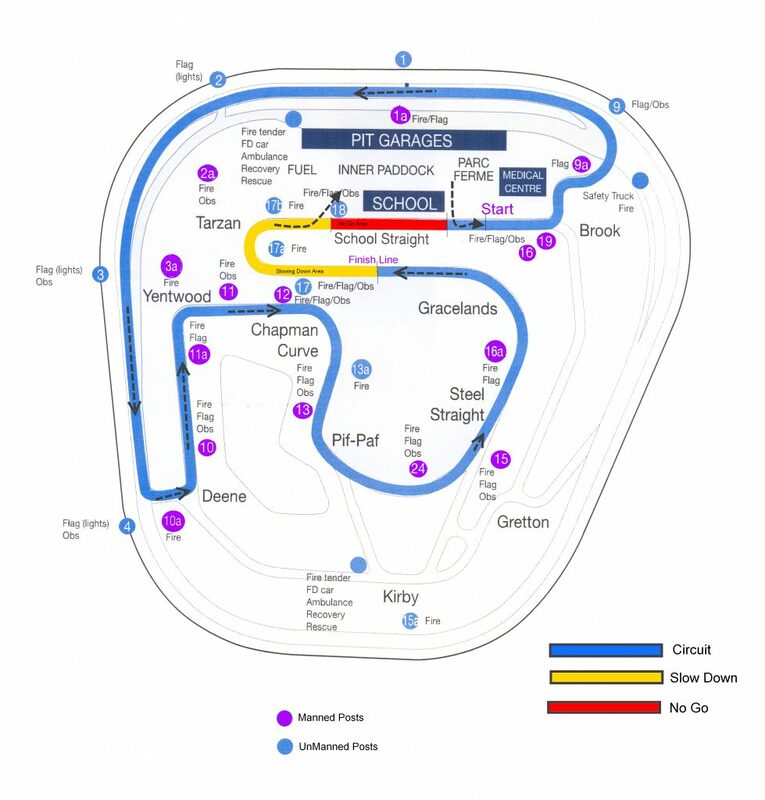 You will track around in a shallow arc left until the turn in point for turn two. Try not to turn in too early, but you will need to drop down to the yellow lines on the apex and follow them for while as this is an Indy style corner with a very long apex. Hold the bottom line until you see the corner open up and then gradually allow your car to run back up to the wall. Take care to be in control as you do this, winding off the lock and letting it run will avoid over steer on exit. If you do lose control, my advise is always stand on clutch and brake until you come to a complete halt. With such a wide track, you have a good chance to miss most things! You will now approach the Gracelands left hander. Take care as it tightens slightly on exit so a steady entry and build speed as it opens up using all the road on the right as you cross the finish line. All the preceding information remains relevant for 2018. I would probably say that when you exit Brook Chicane, open up the exit onto the banking as much possible and really focus on building speed up toward the outer wall. It’s easy to stay too tight and anything you can add to your exit pace will be of benefit all the way around to Deene Hairpin. Although Deene is a hairpin, it’s actually a pretty quick one. So, treat it as two medium speed left-handers. You’ll be surprised how much speed you can carry through. I guess overall my advice is to keep your speed up wherever you can. In places, it’s a far quicker track than it looks! As ever on a circuit, use practice to learn the lines. Once you’ve got those, the speed will come. Good Luck!